Objectives: Due to enhanced life expectancy and an increasing elderly population, sexual and physical problems related to menopause are essential from the health point of view. 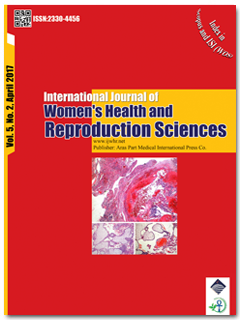 This study was performed to evaluate the effect of Ginkgo biloba tablet and aromatherapy inhaler combination (lavender, fennel and geranium and rose) in decrement of sexual dysfunction in postmenopausal women. Materials and Methods: This double blind randomized clinical trial was performed on 180 postmenopausal women with age range of 45-55 years referring to health care centers in Ardabil University of Medical Sciences, Iran. The participants were randomly divided into 3 groups of 60 subjects: Ginkgo biloba tablet and placebo aroma solution users, aroma solution with placebo Ginkgo biloba users, and placebo aroma with placebo Ginkgo biloba users who received 40 mg Ginkgo biloba either in tablet or placebo and 2-3 drops of aroma solution or placebo on the skin, 3 times a day for 6 weeks. The tool for collecting data was a questionnaire encompassed questions on the socio-demographical features and female sexual function index (FSFI). The primary outcome was the sexual function mean score after intervention in the research groups. The analysis was conducted according to intention-to-treat. Results: The mean (SD) scores of total sexual function at baseline in aromatherapy, Ginkgo biloba and placebo groups were 18.4 (5.4), 17.5 (6.8) and 15.8 (5.7) that enhanced to 22.9 (3.3), 21.6 (4.5) and 17.2 (4.2) in the mentioned groups respectively after intervention. Analysis of covariance (ANCOVA) test indicated significant discrepancy after intervention in total (P < 0.001) and all sub-domains scores of sexual function (P < 0.003) with exception of pain in Ginkgo biloba and aromatherapy groups compared to placebo with controlling of confounding factors. Conclusion: Aromatherapy inhaler combination and Ginkgo biloba tablet improved sexual function in postmenopausal women.